You simply do not lay the accumulator! This method is therefore not risk free and has a significant element of risk. This is because if 2 or more teams do not win, then you lose the accumulator bet and also do not receive a free bet refund. This method is should only be by experienced matched betters with a large profit to date, so they can handle the swings of not laying accas. Your profit on an individual acca will depend on the how many teams win as shown above, but over the longer term you should average the expected profit. There are no lay bets being placed, so there is no Exchange commission being paid. How Often Will Each Outcome Happen? It depends on the average back odds of your teams. The higher the odds, the more likely your teams will lose. You make a £6.20 expected profit (as explained in the 'Expected Profit Per Acca' above), plus you will win quite consistently as 'All teams winning' outcome is just over 35% whilst '2+ teams losing' outcome is only just over 20%. You only make a £2.10 expected profit and the swings will be large, as 'All teams winning' outcome is just over 10% whilst '2+ teams losing' outcome is only almost 60%. 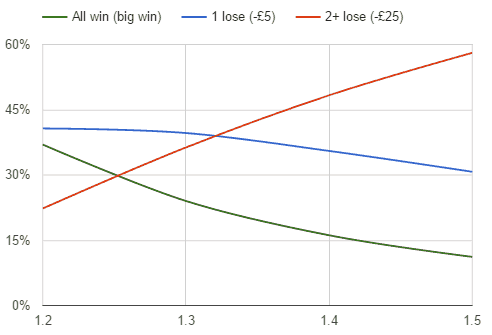 So by choosing teams with lower odds for the No Lay Accumulators Method, you are both maximising your profit per acca, also minimising your swings. As you are not laying, you do not need a balance in your exchange. However, you will need large bookmaker balances to deal with the swings. This is particular true given each weekend the a lot of the same teams will be in each of your bookmaker accumulators. Therefore, if you are placing a £25 accumulator on 4 different bookmakers, you may have say Arsenal and Man Utd in both accas. If they both lose, then you'll lose all 4 accumulators for a £100 loss! I would want to have at least 50 x my accumulator stake in my funds to deal with the swings e.g. if I am placing £25 accumulators using the No Lay Method, I would want at least £1,000. Plus there is an excellent chat thread for discussions on this current no lay accas members are doing, it has over 6,000 posts! Here is the chat thread. 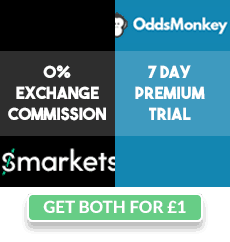 Overall, I would only recommend experienced matched betting who are willing to accept potential large losses despite the expected profit, given results can go against you. To start profiting from football accumulators using the No Lay method, check out the OddsMonkey Acca Matcher article.